Should Apple Be Forced to Lock Out Apps When Driving? A class action lawsuit was recently filed in Los Angeles Superior Court against smartphone giant Apple. The lawsuit is seeking to hold Apple liable for a number of different automobile collisions that happened when drivers were distracted by texting or using features like apps on their iPhones while driving. According to the lawsuit, the plaintiffs are asking that the court issue an injunction against Apple to prevent it from selling any new iPhone 6 phones in the state without the company first installing a safety lock feature. The feature would prevent people from texting while they drive, and Apple has apparently had the technology for the safety feature since 2008. The company was granted a patent for it in 2014 but has not installed it. The lawsuit is also asking that Apple is ordered to update phones that people have already purchased to add the feature to them. The lead plaintiff of the lawsuit was rear-ended when she was stopped at a stoplight by a driver who was on her iPhone at the time. Another lawsuit was also filed against Apple a month earlier in Santa Clara County Superior Court. In that case, a family is suing Apple and asking that it is ordered to install the safety feature. Their 5-year-old daughter was killed when a 20-year-old man who was using Facetime rear-ended the family’s car. Distracted driving has become a huge public health and safety issue in the past couple of decades. With the widespread availability of smartphone technology, distracted driving has become even more problematic. The U.S. Department of Transportation estimates that as many as 1.5 million people are texting and driving each moment. The National Highway Traffic Safety Administration has stated that texting and driving is six times more dangerous than drunk driving is. In 2014, the National Safety Council said that texting while driving accounts for 26 percent of all car accidents that happen in the U.S. Since 500,000 accidents happen in California each year and Apple has a market share of 40 percent in the state, that would equate to 52,000 California accidents that are caused by texting while driving every year. Like most other states, California has laws banning distracted driving, but the laws are difficult to enforce. Law enforcement officers cannot always see when people are texting on their cell phones. In many cases, people will simply deny that they were texting and driving when they are asked by law enforcement officers. Because of search and seizure laws and rights, police officers are not allowed to take people’s phones and search them in order to see if they were texting and driving without getting a warrant. In order to get a warrant, the officer must first write an affidavit outline that the officer has probable cause to believe that the person was texting and driving, and a judge must then find that probable cause exists before granting a search and seizure warrant. Meeting that basic hurdle is difficult and time-consuming, meaning that officers often simply take people at their word and don’t enforce the texting and driving ban by writing citations. In order to prevail in a civil case like this one, plaintiffs have lower burdens than do criminal prosecutors. In a criminal case, a prosecutor must prove every element of the charged offense beyond a reasonable doubt. By contrast, the burden of proof for people who are injured and who file civil suits is by a preponderance of the evidence. This means that civil plaintiffs must show that it is likelier than not. In the case against Apple, the plaintiffs would need to prove that Apple knew that accidents were a reasonably foreseeable result of not installing the safety feature in its phones. The plaintiffs would also have to demonstrate that Apple owed a duty of care to keep them safe and that the company breached its duty by failing to install the safety feature that the company owns. After meeting the initial hurdle, plaintiffs will then need to show that Apple’s breach of its duty caused their accidents and that the plaintiffs suffered harm as a result. In these cases, Apple is likely to argue that the actions of the drivers were an intervening cause of the accidents, negating its liability. It will be interesting to watch as this case unfolds. One reason the plaintiffs believe that Apple has not installed the app despite having the technology is that the company believes that its market share would decrease if the feature was installed. In other words, the plaintiffs allege that Apple is worried that more consumers would choose android phones instead of iPhones if the android phones did not lock out drivers from using apps while driving. If the plaintiffs in this case are successful, however, the injunction against Apple might lead to other cell phone manufacturers also installing similar lockout features on their phones. This would be because those companies may then be concerned about also being sued if their phones are being used when people cause accidents. Interestingly, the NHTSA issued voluntary guidelines in late 2016 calling for cell phone manufacturers and car makers to develop and install safety features that could lock out drivers from using most of the features on their smartphones while driving. While the guidelines are voluntary, both industries may end up moving in that direction, developing pairing systems and driver modes. When people are injured in accidents that they suspect were caused by drivers who were distracted by their cell phones, the injured people might need experienced legal help. 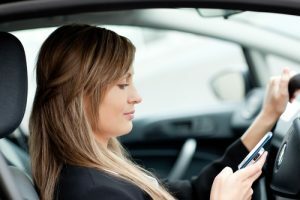 An attorney might be able to subpoena the driver’s cell phone records in order to determine if the driver was using his or her phone at the time of the accident. This may help to build a strong case for recovery for the attorney’s clients.